WASHINGTON -- A top U.S. Republican lawmaker has called for more to be done to punish Russia for its "aggressive acts" in Syria, Ukraine, and elsewhere, as pressure grows in Congress to move more forcefully against Moscow. 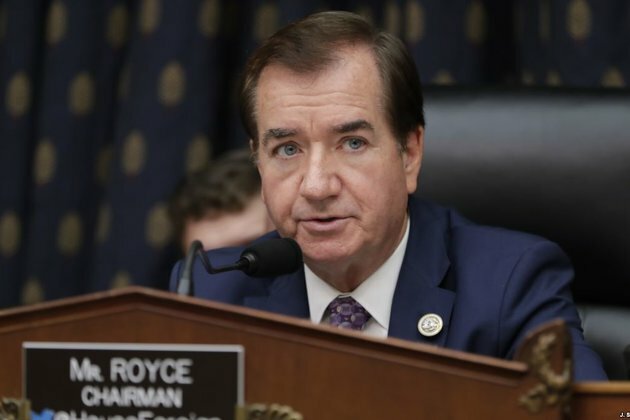 The September 13 comments by Representative Ed Royce (Republican-California) came one day after President Donald Trump's administration unveiled new measures aimed at strengthening election security, ahead of midterm congressional elections in November. The measure set up the potential for sanctions on foreign countries or people who interfere in U.S. voting. But congressional Republicans and Democrats have joined a push for more concrete actions against the Kremlin, a push that has contrasted with some of Trump's past calls for a more conciliatory policy toward Russia. New bipartisan legislation introduced in August -- titled the Defending American Security From Kremlin Aggression Act of 2018 -- proposes new sanctions and other punitive measures, going beyond those imposed last year in legislation that Congress passed nearly unanimously, over Trump's objections. Among other things, the bill would impose sanctions on any Russian energy transactions, prohibit licenses for U.S. citizens and companies hoping to engage in Russian oil projects, and also curtail Russia's ability to issue new sovereign debt. Prospects for the bill are uncertain, particularly with lawmakers gearing up to campaign ahead of the midterm elections. At a House Foreign Affairs Committee hearing on September 13, Royce said he thought the Trump administration had not been doing enough. 'We cannot expect Vladimir Putin and his corrupt associates to change their behavior in Syria, Ukraine, or anywhere else until we prove we will hold them to account,' he said. 'Those still engaged in significant business with designated Russian individuals and entities need to pay a price." Several lawmakers pressed sanctions officials from the State and Treasury departments on whether the Trump administration could do more not only against Russia, but also Iran and North Korea. Other lawmakers, including Democrat Thomas Suozzi, pointed to Russian aircraft manufacturer Sukhoi, pressing Assistant Treasury Secretary Marshall Billingslea on why the administration wasn't targeting the company, which makes fighters jets and passenger planes. Billingslea also said officials will aggressively enforce the sanctions that the Trump administration recently announced it was reimposing on Iran. Earlier this year, Trump said he would roll back the landmark 2015 nuclear agreement against Tehran.